Share this product and receive a $3.41 sharing discount. 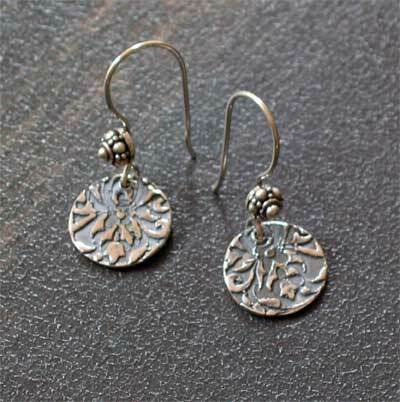 Adorable .925 sterling drop medallion earrings from Ashleigh. This pierced earring set has a scripture reminder on one piece and the scripture reference on the other. This set has 'For God did not..' on one and '1 2 Timothy 1:7' on the other. The actual scripture in the NIV translation reads... 'For God did not give us a spirit of timidity, but a spirit of power, of love and of self-discipline.' What a clever reminder. The medallions each measure 1/2". The medallion is sterling. The front of the medallion has a simple vine leaf motif. The actual clasp may vary - a silver shepherd's hook is shown. No worries though. All of Ashleigh's work is fabulous! 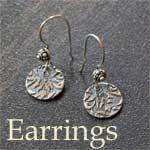 This earring set goes nicely with all of Ashleigh's pendants and bracelets. See below.